Charter schools are among the most debated and least understood phenomena in American education today. At the heart of these matters is a contested question of accountability. To survive, charter schools must make and keep promises about what students will experience and learn under their purview. However, unlike public schools, charter schools do not rely exclusively on their relationship with school districts. They must also look to parents, teachers, and donors to cooperatively establish expectations of a particular school and its mission. Aimed toward elected officials, school reform activists, and educators, this book is the result of the first national-scale study of charter school accountability. The authors researched one hundred-fifty schools and sixty authorizing agencies in Arizona, California, Colorado, Georgia, Massachusetts, and Michigan. These states contain the majority of charter schools that have been operating for three years or more and represent the major differences in state charter school legislation. The authors include interviews from a range of participants in the field©¡from state legislators and administrators to principals, teachers, and parents. 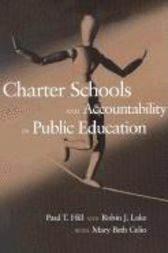 In assessing the structure of accountability as it works internally to bolster external confidence, Hill and Lake suggest the struggle of charter schools actually complements those of standards based reform. Both seek to transform public education to make schools responsible for performance, not compliance. Paul T. Hill is coauthor (with Mary Beth Celio) of Fixing Urban Schools (Brookings, 1998) and (with Christing Campbell and James Harvey) of It Takes a City (Brookings, 2000). He is a nonresident senior fellow at the Brookings Institution and a research professor at the University of Washington's Daniel J. Evans School of Public Affairs. Robin J. Lake is associate director of the Center on Reinventing Public Education at the University of Washington. Mary Beth Celio is a statistical consultant to the University of Washington's Center on Re-Inventing Public Education. She is also the demographer for the Catholic Archdiocese of Seattle.